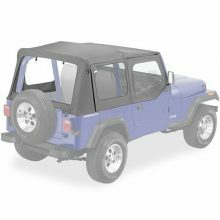 Pavement Ends makes high quality replacement soft top for Jeep YJs, so if you’re looking for a quality top that won’t break the bank then Pavement Ends is a great choice. The Replay model is designed to be a basic, factory style replacement, where you use your existing hardware (frame). 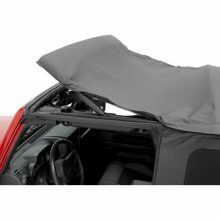 This kit is only the fabric and windows of the top – all made of weatherproof fabric and held together with industrial thread. The Replay top is available in three colors (Charcoal, Black Denim, and Spice). This top is a great choice if you’re trying to keep things affordable, but isn’t as good of some of the higher end Bestops (important to note that Bestop owns Pavement Ends, and Pavement Ends is essentially the budge arm of Bestop). 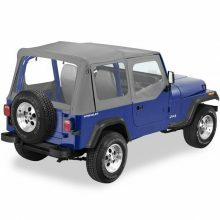 You can get this top with or without upper doors (this applies only if you have half doors on your YJ, if so you can buy the upper fabric portion that matches this top). Overall this is a good buy if you’re strapped for cash. If you can handle paying $200 – $300 more, you may be better off with a high end Bestop.